Remember to specify this sub-fund in the donation box – All money goes directly to these activists. Helena, MT – On the morning of July 12th, six activists from Earth First! 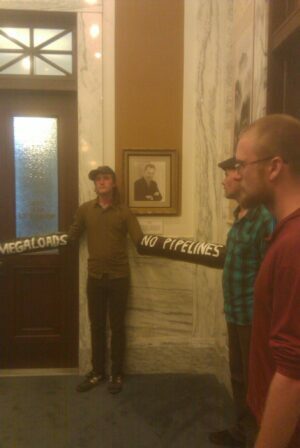 and Northern Rockies Rising Tide have risked arrest by occupying Governor Schweitzer’s office in an act of non-violent civil disobedience. The activists have locked their arms in a mock oil pipeline made out of PVC plastic pipe. In the wake of the Silvertip spill, Governor Schweitzer has publicly chastised Exxon Mobil, while simultaneously continuing to promote the construction of the Keystone XL pipeline, megaload shipments bound for the Alberta Tar Sands and other extreme fossil fuel projects throughout the state. “If the Governor has his way, Montana will be transformed into what is essentially an energy extraction colony for Big Oil. The Silvertip spill is simply a short preview of what this would mean for the lives and livelihood of all Montanans,” says Great Falls native Peter Dolan, one of the eight occupying the office. 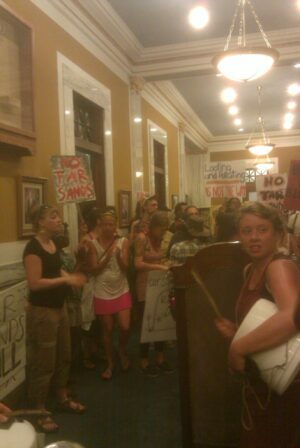 Activists wearing "lock boxes" at office of Montana Governor Brian Schweitzer. Activists inside the Capitol are also demanding that Schweitzer stand up to TransCanada and other international criminal organizations by publicly opposing Alberta Tar Sands exportation. This project is widely known as the most destructive energy process on the planet by leading environmental organizations. According to a recent report by University of Nebraska-Lincoln engineering professor John Stansbury, neither TransCanada nor the regulators evaluating the proposed Keystone XL pipeline have properly considered the risks. Stansbury said TransCanada underestimated both the frequency of spills on the pipeline and the severity of the worst-case scenario spills. “As the recent ExxonMobil pipeline disaster has made clear, Governor Schweitzer is attempting to turn Montana into an extraction state, while at the same time publicly proclaiming his supposed support for clean energy, protecting the environment and building healthy communities. It’s one or the other. You can’t be clean and dirty at the same time,” according to Bozeman’s Erica Dossa, who also took part in the action. Earth First! was named in 1979 in response to a lethargic, compromising and increasingly corporate environmental community. Earth First! takes a decidedly different approach towards environmental issues by using all the tools in the toolbox, ranging from grassroots organizing and involvement in the legal process to civil disobedience. Northern Rockies Rising Tide is the Missoula based chapter off the international, decentralized, grassroots movement Rising Tide. They are an all-volunteer network of groups and individuals who promote local, community-based solutions to the climate crisis and take direct actions to confront the root causes of climate change. Please donate to support REAL ACTIVISM. All proceeds sent to this account will go toward legal fees or other costs that will be incurred by the activists risking arrest. Show the world that when you stand up for a livable future, others will have your back. Not a PayPal user? We don’t blame you. We’ve set up a special sub-fund to support this action as well. Make sure to select “PeaceUp BackUp” from the drop-down menu in the donate box. Thank you. Thank you thank you thank you! 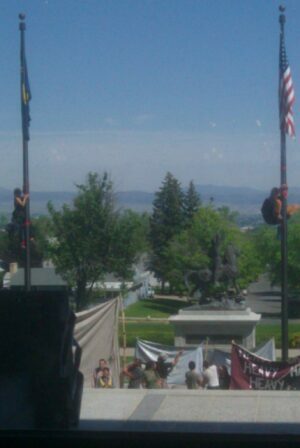 As a “tribal elder” who has worked much of my life on behalf of workers’ rights and environmental issues I was moved to tears of joy watching the joy-filled full of peace action in Montana. Keep on keeping on!